The University of Akron's Art Bomb Brigade and ArtsLIFT programs selected me as team leader for the Freedom Trail mural project they were doing for Summit Metro Parks. With nine months to prepare, we surveyed Akron's 2-mile stretch of trail and identified over 24 potential areas for mural development. Recognizing the opportunity to create a unique and iconic experience in Akron's recreational corridor, I proposed a strategic plan that would include designs for all walls. We aligned on a literary mural concept that would celebrate and feature the work of Rita Dove – an Akron native, Pulitzer Prize Winning Poet, and Consultant in Poetry to the Library of Congress. I reached out to Rita, who graciously offered a selection of poems specifically for the Freedom Trail. The Art Bomb Brigade selected "Dawn Revisited," which was then developed for several locations to accommodate construction. 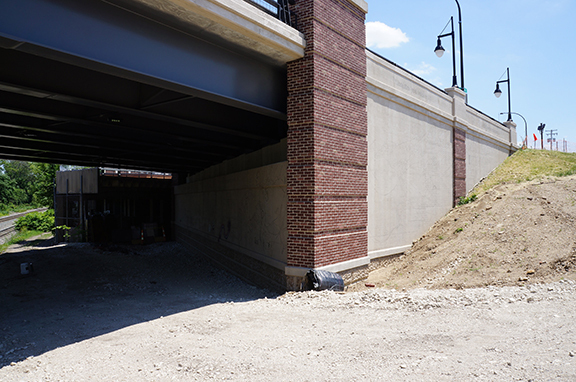 The final design was hand illustrated directly on the wall for the final location on southeast side of the Mill Street Bridge and underpass, in downtown Akron. 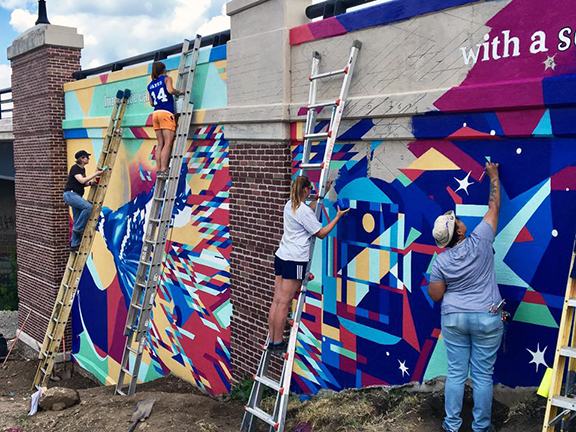 I led the team of 25 college and high-school students in the production of the mural, working in collaboration with Elisa Gargarella and Dan Coffield, to paint everything in two weeks. Dawn Revisited has since been prominently featured in local news, tourism, marketing, and social channels as a reflection of Akron's emerging identity as a national leader. We greatly look forward to the opening of the Freedom Trail so that visitors can safely and easily explore all that Akron and Northeast Ohio has to offer. Exterior latex paint on primed cement and stone walls.